When Ana Ines King moved from Colombia to Richmond, Virginia, in 1994, her daughter was just 11 years old. The transition was hard for them both—neither spoke English when they arrived—but King’s daughter found it particularly difficult. The only time King remembers seeing her happy was in school, when students who were originally from other countries were invited to teach their classmates about parts of their culture. In 1997, King founded Latin Ballet of Virginia, a professional dance company that presents five productions annually and a dance school with an enrollment of 400. She was so inspired by her daughter’s experience that in 2000, she went on to create the Be Proud of Yourself educational program, which promotes arts education through 8- to 15-week school residencies in the Richmond metro area and throughout central Virginia. The program reaches about 20,000 children through lecture-demonstrations and workshops, and is run by LBV staff. Be Proud of Yourself activities range from interactive workshops in Latin American and Spanish dance and culture to classes modeled on dance and music therapy that serve children with autism, ADHD, and other learning or developmental challenges. LBV also produces EveryBody Reads! a creative arts-integrated literacy initiative funded last summer by the National Endowment for the Arts. Residencies that guide public school students to re-create stories through dance, and company performances of productions steeped in Latin culture, are just some of the activities that the program offers. Each Be Proud of Yourself residency is tailored to the needs and population of the school it serves. Public and private schools partner with LBV staff and teachers to design experiences for students typically ranging from 11 to 16 years old. In every instance, the program seeks to enhance students’ confidence and self-esteem. Most residencies culminate in some type of performance, whether by the students themselves, or by LBV’s professional company. Students who don’t feel comfortable performing are not forced to, says Pérez-Obregón; the emphasis is on building confidence. She stresses the program’s versatility. LBV’s instructors are given a framework, and can design their own activities within it, based on the needs of the students in front of them. “The important thing is to get to know your students. What works at one school may not work at another school,” she says. Some schools want workshops in ESL through dance. Some want instruction in Spanish language through dance. EveryBody Reads! is adaptable for Spanish, English, and French language classes. 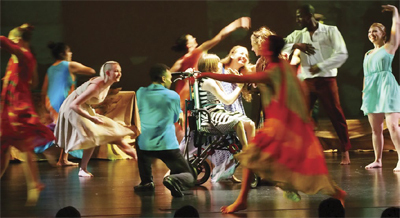 One iteration focuses on discussion and analysis of Antoine de Saint-Exupéry’s The Little Prince in one of the three languages, culminating in a performance of LBV’s dance theater version of the story by the professional company, followed by a post-performance question-and-answer session with students. Study guides available online at LBV’s website describe each component of Be Proud of Yourself, including themes, methodology, and learning objectives such as building confidence, and making connections between dance and other fields of study. Guides also list the Virginia Standards of Learning met by each Be Proud of Yourself program component. For example, the Spanish and Latin American dance theme meets state education standards in the Family Life, Spanish Language, and Physical Education categories. Since schools generally seek grant funding to support the program, tying arts education directly to curriculum and standardized testing helps administrators build a strong case for support. So do the program’s success stories. Communicating with parents provides a way for LBV instructors to track students’ development during Be Proud of Yourself residencies. Pérez-Obregón says instructors are encouraged to develop relationships with parents by letting them know about proud moments. “If they did the smallest thing that you’re so proud of, calling the parents before the students get home to let them know is a huge tool.” Parents can in turn help instructors by letting them know of positive changes they see in their children as they progress through the program. Lea Marshall is a writer and associate chair of the Virginia Commonwealth University Department of Dance and Choreography. Ana Ines King talks passionately about her beginnings in RVA and how Latin Ballet's conception was based on her daughter's acclimation to United States culture and schools.